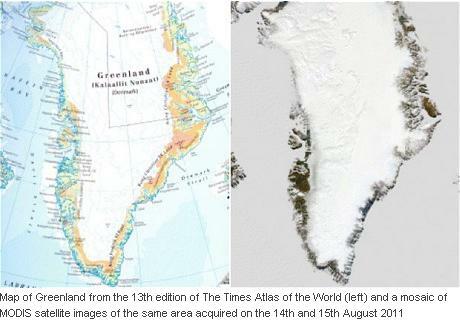 It is quite possibly the best-respected mainstream atlas in the world, but the Times Atlas of the World has attracted the scorn of scientists this week after publicity for its new issue claimed 15 per cent of the mass of Greenland had ato be erased to reflect the impact of ice loss due to warming. The publishers claim improved accuracy of measurements has shown a 15 per cent reduction in Greenland ice cover in 12 years. TV3 News ran a piece on the story (from ITV last night). But scientists are rejecting the claim and already labelling it worse that the “glaciergate” debacle, which saw eroneous information in an IPCC report overstate the chances of Himilayan glaciers disappearing due to climate change. Here’s what Jethro Lennox, publishing manager, Times Atlases claims in the promotional video that was released to announce the new edition of the Times Atlas of the World, which is updated every four years. Glaciologists were quick off the mark in responding – my colleagues at the Science Media Centre in London rounded up their comments. ’Fortunately the mistake about the Greenland Ice Sheet is much more obvious and indefensible than the Himalayan error. In the aftermath of ‘Himalayagate’, we glaciologists are hypersensitive to egregious errors in supposedly authoritative sources. Climate change is real, and Greenland ice cover is shrinking. But the claims here are simply not backed up by science. This pig can’t fly. ’There are various ways to quantify the scale of the mistake. For example the global average rate of glacier shrinkage is somewhere near to 0.2% per year, but that number is heavily influenced by very small glaciers. Glacier shrinkage on the global scale is difficult to grapple with, but one clear conclusion is that smaller glaciers shrink much faster (in percentage terms) than bigger ones. The Greenland Ice Sheet is the second biggest glacier of all, and the Times Atlas’ contention that it has lost 300,000 sq km in the past 12 years, that is, at a rate of 1.5%/yr (because its nominal area is 1.7 million sq km), would be very surprising indeed if it could be validated. The best measurements in Greenland, which cover only part of the ice sheet, suggest that 1.5%/yr is at least 10 times faster than reality. It could easily be 20 times too fast and might well be 50 times too fast. How did this happen? According to Ms Barclay at the scale of the Greenland map (1:12,500,000) only ice thicker than 500 metres is shown. But this is patently not the case. On the same spread in the Atlas, at the same scale, small ice caps in both Iceland and British Columbia are also shown in white. I asked the scientists at the SPRI to confirm that these ice caps were much thinner than 500 metres and they were able to do so. It gets worse. The Greenlandic ice cap is marked with a series of contours at 500-metre intervals. But nowhere on the map, or in the Key at the beginning of the Atlas, is it made clear what these contours refer to. It cannot be altitude as many intersect with another set of contours which clearly DO show height above sea level. These contours seem to be ice-thickness contours, produced from radar data. Fair enough, but this needs to be explained, which it is not, and it also needs to be explained why other ice-covered areas (including Antarctica, Iceland, Canada etc) are marked with elevation-contours not ice-thickness contours. Worst of all, according to the SPRI, the publishers did not, as they are claiming, use the same method in 1999 — when even quite small mountain glaciers in Greenland were shown, properly, as ‘ice covered’. I’d expect, in the face of such reaction from the scientific community, the atlas will have to be recalled, those copies (which sell for 150 pounds each), will have to be destroyed. At the moment however, the publishers seem to be standing by their atlas claims as this article from Science suggests.